The window displays only applications that are compatible with the connected device. To view the list of all applications, disconnect the device from the computer. Paid applications that require one-time payment for the installation in the app store. Paid applications are marked with the icon. Addappter configuration doesn't include applications with subscriptions (such as monthly or annual payments). Applications with a promo code for a service (for example, a free taxi ride, one month of listening to music for free, and so on). Promo applications are marked with the icon. There are several ways to choose the application to install. You can use any method or combination of methods (for example, choose an application bundle and find missing applications by genre). In the smart setup mode, the program suggests applications from each genre. Genres are suggested one by one, from the first to the last in the list. To turn on this mode, click Smart setup at the top of the window. Bundles contain applications related to a common topic (for example, social networks, games, sports, and so on). To install one or several application bundles, choose Bundles from the menu in the left part of the window. 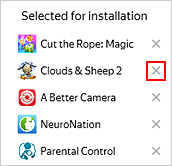 To install only some applications from the bundle, but not the entire bundle, click the icon next to the bundle and choose applications. As a rule, application bundles are put together by the Addappter project manager in your store. You can create your own local bundles. In the left part of the window, choose Genres and click on the name of the genre. 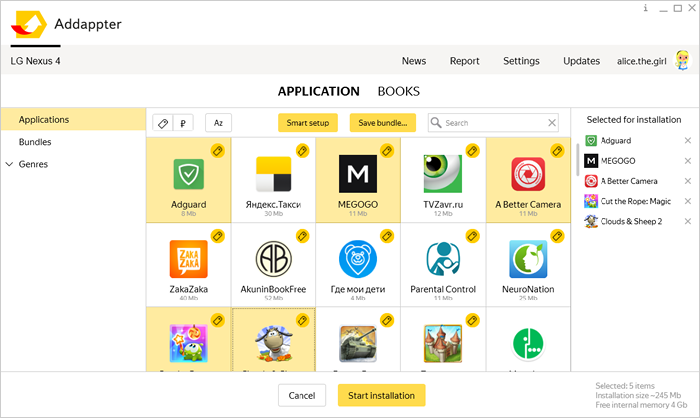 You can choose applications from different genres for installation. To view only promo applications, click the button. To view only paid applications, click the button. If there are no paid or promo applications in Addappter at the moment, the buttons are not displayed. Enter the application name in the search field at the top of the window. The search is made among all applications available for the device, regardless of the method used for choosing applications (in bundles, by genre, or from the list). If you turned on application list filtering (viewing just paid or promo applications), the search results will display only the selected application type. In smart mode, application search is unavailable. To add an application to the list for installation, click its name. The application is added to the Selected for installation block (in the right part of the window). To cancel the installation, move the mouse pointer over it — the icon will appear to the right of the name. Click it to remove the application from the list. In addition to applications, you can choose books for downloading. The chosen books are downloaded to the device at the same time when the applications are installed. To install paid apps, you need to log into the program. Click the Start installation button at the bottom of the window. 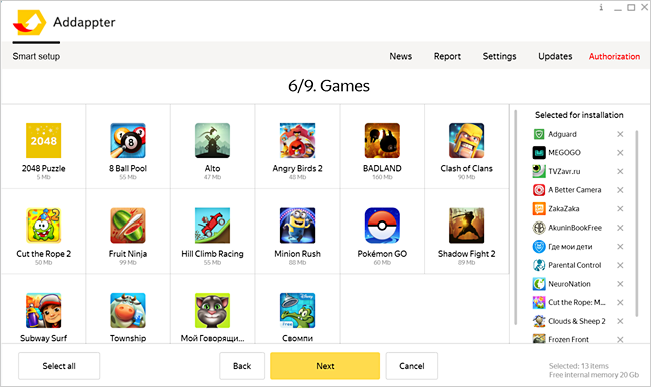 Addappter will start installing the applications and Russian language support on the device. Don't disconnect the device from the computer until all operations are completed. If some of the installed applications are paid, a window for entering the PIN code opens. Enter your PIN code to continue the installation. Wait for Addappter to show the final installation status. 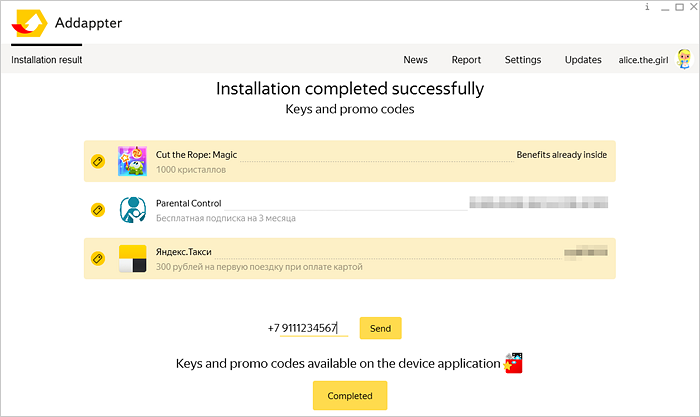 If there are paid or promo applications installed, or applications that require a license key, the list of promo codes and license keys is also displayed on the screen. All promo codes and license keys are added to the “Applications” app on the customer's device. You can also send the codes and keys to the customer in an SMS message. To do this, enter the phone number (starting with +7) at the bottom of the window and click the Send button. A text message with a link to the list of promo codes and license keys for installed applications will be sent to the specified number. Each promo code can be used only once. Click the Completed button in the program. You can disconnect the device from the computer. If the Use fast install setting is turned on in Addappter, the installation process may continue in the background. To follow it, open the Applications app on the device. Before the device setup is completed, you can't troubleshoot it or move the data.